DR Main Floors was recently required to complete a job with two different floor types in Toowong; pine floors that were intermixed with old floorboards. 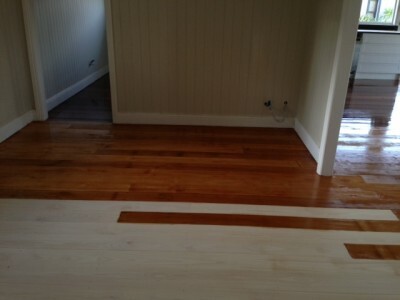 Staining of the old boards was required to ensure a seamless blend between the two types of flooring. As well as colouring the timber, staining enhances the grain, giving even the more common timbers a distinctive appearance. Staining is a sophisticated and premium method to strengthen the colour of your floors. To create the best possible results, DR Main Floors took their time to ensure precision and technique was used throughout the process. Ensuring the best possible outcome when staining floors is achieved through the extensive staining experience and knowledge from the hands on experience that Glyn has for over 25+ years in the flooring industry. Trying to match old and new pine floors can require multiple colours of stain to be used to achieve the end result of a floor that is hard to tell old boards from new. Staining floors is not just as simple as picking up a can of stain and putting it on the timber, It takes skill and years of staining experience to achieve the right outcome. This job took three days to complete. The floor was finished with a Polyurethane gloss finish to create a fresh and bright look that suits modern homes. The finished product in Toowong, QLD. Another successful job done by the team at DR Main Floors!